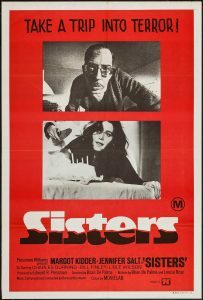 SISTERS isn’t Brian De Palma’s first film, but it might as well be called that because this is the first film where we got acquainted with his real tastes and his all-time admiration to the works of Alfred Hitchcock. It also introduced us to his love for split-screen techniques, long takes, over-the-top and dark humor, and violence. Although this is a lower-budget film than his later efforts, SISTERS shows what De Palma is truly capable of as a stylish visual storyteller. It’s not his best work, but it’s quality De Palma. The story is a bit strange, rather implausible, but in the end it doesn’t matter. Some of De Palma’s Hitchcockian thrillers are usually divorced from reality anyway, and rely solely on his skills as an excellent director and storyteller to grab the audience. It works, albeit not for everyone, which is why De Palma gets such a bad rap. While it’s true that his later works were either works of a hired hand (his later films were Hollywood blockbusters) or works of someone who further alienates himself from his critics (FEMME FATALE is a quintessential De Palma film, suffice to say critics hated it), De Palma remains a natural born filmmaker who still believes in the real role of a director in a film, which is why most of his movies are “Director’s movies”. SISTERS has this quality, especially the visual style which is just impressive. The use of split-screen is rather primitive here (it would be put to greater use later), but De Palma is already getting the hang of the technique and knowing what to do with it. The scene where it is used, two suspects trying to cover up for a fresh murder before the police arrive, is captured perfectly as two separate events simultaneously occurring. The humor too is there. In the opening scenes, De Palma sends up the era’s racial discrimination by having a black contestant in a game show receiving a free dining pass to the “African Room.” It’s little sequences like these that De Palma would use in later films. There’s also, of course, the set-piece murder scene sprinkled with some semi-sadistic black humor amongst the carnage. Above all, the standout of theme of SISTERS is what De Palma would keep on using in his later films: The study of characters as voyeurs. There’s also the use of the plot about voyeurism here since most of the characters are always looking, sometimes at things they are not meant to see. He even shamelessly borrows from Hitchcock’s REAR WINDOW in one sequence, and successfully repeats Hitchcock’s way of manipulation to keep audiences’ palms sweating. There are a lot of Hitchcock allusions here (of course). Basically, the plot is PSYCHO by way of REAR WINDOW, with the use of doubles (another recurring De Palma motif) as in VERTIGO. The great Bernard Herrmann provides an odd yet superb score, sort of a medley of his VERTIGO and PSYCHO score and some of the cues from his THE DAY THE EARTH STOOD STILL score. Overall, fans of De Palma will love this and I doubt that they haven’t seen this gem. Despite the low budget and the occasionally dated moments, SISTERS is a great Hitchcockian thriller in pure De Palma fashion. I’ve only been into De Palma’s works recently and already I’m hooked.